This article is about the Turkic tribe. For the Russian weapon, see Pecheneg machine gun. The Pechenegs were mentioned as Bjnak, Bjanak or Bajanak in medieval Arabic and Persian texts, as Be-ča-nag in Classical Tibetan documents, as Pačanak-i in works written in Georgian. Anna Komnene and other Byzantine authors referred to them as Patzinakoi or Patzinakitai. In medieval Latin texts, the Pechenegs were referred to as Pizenaci, Bisseni or Bessi. East Slavic peoples use the terms Pečenegi or Pečenezi, while the Poles mention them as Pieczyngowie or Piecinigi. The Hungarian word for Pecheneg is besenyő; the Romanian term is "Pecenegi" The ethnonym derived from the Old Turkic word for "brother-in-law” (baja, baja-naq or bajinaq), implying that it initially referred to an "in-law related clan or tribe". Three of the eight Pecheneg "provinces" or clans were collectively known as Kangars. According to Constantine VII Porphyrogenitus, the Kangars received this denomination because "they are more valiant and noble than the rest" of the people "and that is what the title Kangar signifies". For no Turkic word with similar meaning is known, Ármin Vámbéry connected the ethnonym to the Kirghiz words kangir ("agile"), kangirmak ("to go out riding") and kani-kara ("black-blooded"), while Carlile Aylmer Macartney associated it with the Chagatai word gang ("chariot"). Omeljan Pritsak proposed that the name had initially been a composite term (Kängär As) deriving from the Tocharian word for stone (kank) and the Iranian ethnonym As. If the latter assumption is valid, the Kangars' ethnonym suggests that Iranian elements contributed to the formation of the Pecheneg people. Mahmud al-Kashgari, an 11th-century man of letters specialized in Turkic dialects argued that the language spoken by the Pechenegs was a variant of the Cuman and Oghuz idioms. He suggested that foreign influences on the Pechenegs gave rise to phonetical differences between their tongue and the idiom spoken by other Turkic peoples. Anna Komnene likewise stated that the Pechenegs and the Cumans shared a common language. Although the Pecheneg language itself died out centuries ago, the names of the Pecheneg "provinces" recorded by Constantine Porphyrogenitus prove that the Pechenegs spoke a Turkic language. The Huns, Khazars and Pechenegs are thought to have belonged to the same proto-Turkic group of languages as the modern Chuvash language (Oghur dialects). Byzantine emperor Constantine VII Porphyrogennetos lists eight Pecheneg tribal groupings, four on each side of the Dnieper river, reflecting the bipartite left-right Turkic organization. These eight tribes were in turn divided into 40 sub-tribes, probably clans. Constantine VI also records the names of eight former tribal leaders who'd been leading the Pechenegs when they were expelled by the Khazars and Oghuzes. Golden, following Németh and Ligeti, proposes that each tribal name consists of two parts: the first part being an equine coat color, the other the tribal ruler's title. The first three tribes in the list below formed the Qangar/Kenger (Greek: Καγγαρ) and were deemed "more valiant and noble than the rest". ^ From qorqut- "to frighten"
^ a title meaning "translator"
Paul Pelliot originated the proposal that the Book of Sui—a 7th-century Chinese work—preserved the earliest record on the Pechenegs. The book mentioned the Pei-ju people who had settled near the En-ch'u and A-lan peoples (identified as Onogurs and Alans, respectively), to the east of Fu-lin (or the Eastern Roman Empire). Victor Spinei emphasizes that the Pechenegs' association with the Pei-ju is "uncertain". He proposes that an 8th-century Uighur envoy's report, which survives in Tibetan translation, contains the first certain reference to the Pechenegs. The report recorded an armed conflict between the Be-ča-nag and the Hor (or Ouze) peoples in the region of the river Syr Darya. Ibn Khordadbeh (c. 820 – 912 CE), Mahmud al-Kashgari (11th century), Muhammad al-Idrisi (1100–1165), and many other Muslim scholars agree that the Pechenegs belonged to the Turkic peoples. The Russian Primary Chronicle stated that the "Torkmens, Pechenegs, Torks, and Polovcians" descended from "the godless sons of Ishmael, who had been sent as a chastisement to the Christians". Omeljan Pritsak says that the Pechenegs' homeland was located between the Aral Sea and the middle course of the Syr Darya, along the important trade routes connecting Central Asia with Eastern Europe. The Orkhon inscriptions listed the Kangars among the subject peoples of the Eastern Turkic Khaganate. Map of Southeastern Europe, c. 1040–70. Pechenegs are called by the alternate name Patzinaks. The Turkic Khaganate collapsed in 744 which gave rise to a series of intertribal confrontations in the Eurasian steppes. 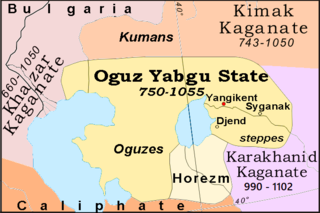 The Karluks attacked the Oghuz Turks, forcing them to launch a westward migration towards the Pechenegs' lands. The Uighur envoy's report testifies that the Oghuz and Pecheneg waged war against each other already in the 8th century, most probably for the control of the trade routes. The Oghuz made an alliance with the Karluks and Kimaks and defeated the Pechenegs and their allies in a battle near the Lake Aral before 850, according to the 10th-century scholar, Al-Masudi. Most Pechenegs launched a new migration towards the Volga River, but some groups were forced to join the Oghuz. The latter formed the 19th tribe of the Oghuz tribal federation in the 11th century. The Pechenegs who left their homeland settled between the Ural and Volga rivers. Their new territory was quite large, with a 30-day-walk extension, according to Muslim sources. Their territory bordered on the Khazars, Slavs, Cumans and Ouzes. The Pechenegs made regular raids against their neighbors and sold their captives. The Khazars made an alliance with the Ouzes against the Pechenegs and they invaded the Pechenegs' land from two directions. The double attack forced the Pechenegs into a new westward migration. They marched across the Khazar Khaganate and expelled the Magyars from the lands along the Kuban River and the upper course of the river Donets. The Hudud al-'Alam—a late 10th-century Persian geography—distinguished two Pecheneg groups, referreing to those who lived along the Donets as "Turkic Pechenegs", and to those along the Kuban as "Khazarian Pechenegs". The latter denominations implies that some Pecheneg tribes had been forced to acknowledge the Khazars supremacy. According to Gardizi and other Muslim scholars who based their works on 9th-century sources, the Pechenegs' new territories were bordered by the Cumans, Khazars, Oghuz Turks and Slavs. The same sources also narrate that the Pechenegs regularly waged war against the Khazars and the latter's vassals, the Burtas. The Khazars and the Oghuz Turks made an alliance against the Pechenegs and attacked them. [citation not found] Outnumbered by the enemy, the Pechenegs started a new migration, invaded the dwelling places of the Hungarians and forced them to leave. [citation not found] There is no consensual date for this second migration of the Pechenegs: Pritsak argues that it took place around 830, but Kristó suggests that it could hardly occur before the 850s. [citation not found] The Pechenegs settled along the rivers Donets and Kuban. It is plausible that the distinction between the "Turkic Pechenegs" and "Khazar Pechenegs" mentioned in the 10th-century Hudud al-'alam had its origin in this period. Spinei proposes that the latter denomination most probably refers to Pecheneg groups accepting Khazar suzerainty. In addition to these two branches, a third group of Pechenegs existed in this period: Constantine Porphyrogenitus and Ibn Fadlan mention that those who decided not to leave their homeland were incorporated into the Oghuz federation of Turkic tribes. However, it is uncertain whether this groups' formation is connected to the Pechenegs' first or second migration (as it is proposed by Pritsak and Golden, respectively). According to Mahmud al-Kashgari, one of the Üçok clans of the Oghuz Turks was still formed by Pechenegs in the 1060s. Originally, the Pechenegs had their dwelling on the river Atil (Volga), and likewise on the river Geïch, having common frontiers with the Chazars and the so-called Uzes. But fifty years ago the so-called Uzes made common cause with the Chazars and joined battle with the Pechenegs and prevailed over them and expelled them from their country, which the so-called Uzes have occupied till this day. [...] At the time when the Pechenegs were expelled from their country, some of them of their own will and personal decision stayed behind there and united with the so-called Uzes, and even to this day they live among them, and wear such distinguishing marks as separate them off and betray their origin and how it came about that they were split off from their own folk: for their tunics are short, reaching to the knee, and their sleeves are cut off at the shoulder, whereby, you see, they indicate that they have been cut off from their own folk and those of their race. In Mahmud Kashgari's 11th-century work Dīwān lughāt al-turk (Arabic: ديوان لغات الترك‎), the name Beçenek is given two meanings. The first is "a Turkish nation living around the country of the Rum", where Rum was the Turkish word for the Eastern Roman Empire (Byzantine Empire). Kashgari's second definition of Beçenek is "a branch of Oghuz Turks"; he subsequently described the Oghuz as being formed of 22 branches, of which the 19th branch was named Beçenek. Max Vasmer derives this name from the Turkic word for "brother-in-law, relative" (Turkmen: bacanak and Turkish: bacanak). By the 9th and 10th centuries, they controlled much of the steppes of southeast Europe and the Crimean Peninsula. Although an important factor in the region at the time, like most nomadic tribes their concept of statecraft failed to go beyond random attacks on neighbours and spells as mercenaries for other powers. According to Constantine Porphyrogenitus, writing in c. 950, Patzinakia, the Pecheneg realm, stretched west as far as the Siret River (or even the Eastern Carpathian Mountains), and was four days distant from "Tourkias" (i.e. Hungary). The whole of Patzinakia is divided into eight provinces with the same number of great princes. The provinces are these: the name of the first province is Irtim; of the second, Tzour; of the third, Gyla; of the fourth, Koulpeï; of the fifth, Charaboï; of the sixth, Talmat; of the seventh, Chopon; of the eighth, Tzopon. At the time at which the Pechenegs were expelled from their country, their princes were, in the province of Irtim, Baïtzas; in Tzour, Kouel; in Gyla, Kourkoutai; in Koulpeï, Ipaos; in Charaboï, Kaïdoum; in the province of Talmat, Kostas; in Chopon, Giazis; in the province of Tzopon, Batas. According to Omeljan Pritsak, the Pechenegs are descendants from the ancient Kangars who originate from Tashkent. In the 9th century, the Byzantines became allied with the Pechenegs, using them to fend off other, more dangerous tribes such as Kievan Rus' and the Magyars (Hungarians). The Uzes, another Turkic steppe people, eventually expelled the Pechenegs from their homeland; in the process, they also seized most of their livestock and other goods. An alliance of Oghuz, Kimeks, and Karluks was also pressing the Pechenegs, but another group, the Samanids, defeated that alliance. Driven further west by the Khazars and Cumans by 889, the Pechenegs in turn drove the Magyars west of the Dnieper River by 892. Bulgarian Tsar Simeon I employed the Pechenegs to help fend off the Magyars. The Pechenegs were so successful that they drove out the Magyars remaining in Etelköz and the Pontic steppes, forcing them westward towards the Pannonian plain, where they later founded the Hungarian state. In the 9th century the Pechenegs began a period of wars against Kievan Rus'. For more than two centuries they had launched raids into the lands of Rus', which sometimes escalated into full-scale wars (like the 920 war on the Pechenegs by Igor of Kiev, reported in the Primary Chronicle). The Pecheneg wars against Kievan Rus' caused the Slavs from Walachian territories to gradually migrate north of the Dniestr in the 10th and 11th centuries. Rus'/Pecheneg temporary military alliances also occurred however, as during the Byzantine campaign in 943 led by Igor. In 968 the Pechenegs attacked and besieged Kiev; some joined the Prince of Kiev, Sviatoslav I, in his Byzantine campaign of 970–971, though eventually they ambushed and killed the Kievan prince in 972. According to the Primary Chronicle, the Pecheneg Khan Kurya made a chalice from Sviatoslav's skull, in accordance with the custom of steppe nomads. The fortunes of the Rus'-Pecheneg confrontation swung during the reign of Vladimir I of Kiev (990–995), who founded the town of Pereyaslav upon the site of his victory over the Pechenegs, followed by the defeat of the Pechenegs during the reign of Yaroslav I the Wise in 1036. Shortly thereafter, other nomadic peoples replaced the weakened Pechenegs in the Pontic steppe: the Cumans and the Torks. According to Mykhailo Hrushevsky (History of Ukraine-Ruthenia), after its defeat near Kiev the Pecheneg Horde moved towards the Danube, crossed the river, and disappeared out of the Pontic steppes. 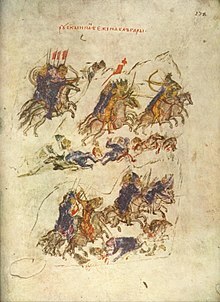 After centuries of fighting involving all their neighbours—the Byzantine Empire, Bulgaria, Kievan Rus', Khazaria, and the Magyars—the Pechenegs were annihilated as an independent force in 1091 at the Battle of Levounion by a combined Byzantine and Cuman army under Byzantine Emperor Alexios I Komnenos. Alexios I recruited the defeated Pechenegs, whom he settled in the district of Moglena (today in Macedonia) into a tagma "of the Moglena Pechenegs". Attacked again in 1094 by the Cumans, many Pechenegs were slain or absorbed. The Byzantines defeated the Pechenegs again at the Battle of Beroia in 1122, on the territory of modern-day Bulgaria. For some time, significant communities of Pechenegs still remained in the Kingdom of Hungary. With time the Balkan Pechenegs lost their national identity and became fully assimilated, mostly with Magyars and Bulgarians. In the 12th century, according to Byzantine historian John Kinnamos, the Pechenegs fought as mercenaries for the Byzantine Emperor Manuel I Komnenos in southern Italy against the Norman king of Sicily, William the Bad. A group of Pechenegs was present at the battle of Andria in 1155. The Pechenegs were last mentioned in 1168 as members of Turkic tribes known in the chronicles as the "Chorni Klobuky (Black Hats)". In 15th-century Hungary, some people adopted the surname Besenyö (Hungarian for "Pecheneg"); they were most numerous in the county of Tolna. One of the earliest introductions of Islam into Eastern Europe came about through the work of an early 11th-century Muslim prisoner who was captured by the Byzantines. The Muslim prisoner was brought into the Besenyö territory of the Pechenegs, where he taught and converted individuals to Islam. In the late 12th century, Abu Hamid al Garnathi referred to Hungarian Pechenegs – probably Muslims – living disguised as Christians. In the southeast of Serbia, there is a village called Pecenjevce founded by Pechenegs. After war with Byzantium, the broken remnants of the tribes found refuge in the area, where they established their settlement. ^ Akdes, Nimet Kurat (1937). Peçenek Tarihi. pp. 22–26. ^ a b c d e f Spinei 2003, p. 93. ^ a b c d Golden 2003, p. I.64. ^ a b Curta 2006, p. 182. ^ Constantine Porphyrogenitus: De Administrando Imperio (ch. 37), p. 171. ^ Macartney 1968, pp. 104-105. ^ a b c d e f g Pritsak 1975, p. 213. ^ Spinei 2003, p. 94. ^ a b Spinei 2003, p. 95. ^ Spinei 2009, p. 181. ^ Spinei 2009, p. 343. ^ Róna-Tas 1999, p. 239. ^ Ukraine: a concise encyclopaedia, Volume 1, pg. 929. Published for the Ukrainian National Association, University of Toronto Press 1963. ^ Golden 1992, p. 265-6. ^ a b c Pritsak 1975, p. 211. ^ a b c d e f g Spinei 2003, p. 113. ^ Róna-Tas 1999, p. 235. ^ Spinei 2009, p. 182. ^ Spinei 2009, p. 186. ^ Pritsak 1975, pp. 211-212. ^ a b c d e f Pritsak 1975, p. 212. ^ a b c d Spinei 2003, p. 114. ^ a b c d e f g h i Pritsak 1975, p. 214. ^ Spinei 2003, pp. 113-114. ^ a b Kristó 2003, p. 138. ^ Kristó 2003, p. 144. ^ Atalay 2006, p. I.57. ^ Constantine Porphyrogenitus: De Administrando Imperio (ch. 37), pp. 167., 169. ^ Maḥmūd, Kāshgarī; James Kelly (1982). Türk Şiveleri Lügatı = Dīvānü Luġāt-It-Türk. Duxbury, Mass: Tekin. ^ Constantine Porphyrogenitus: De Administrando Imperio (ch. 37), p. 167. ^ Ibn Haukal describes the Pechenegs as the long-standing allies of the Rus', whom they invariably accompanied during the 10th century Caspian expeditions. ^ The chronicler explains the town's name, derived from the Slavic word for "retake", by the fact that Vladimir "retook" the military glory from the Pechenegs. ^ Haldon, John, Warfare, State And Society In The Byzantine World 560-1204, Routledge, 2002, p. 117. ^ Ivan Katchanovski, Zenon E. Kohut, Bohdan Y. Nebesio, Myroslav Yurkevich, Historical Dictionary of Ukraine, Scarecrow Press, 2013, p. 439. ^ While his rule's exact end cannot be dated, Kurya was no longer khan by 988. Atalay, Besim (2006). Divanü Lügati't – Türk. Türk Tarih Kurumu Basımevi. ISBN 975-16-0405-2. Golden, Peter B. (2003). Nomads and their Neighbours in the Russian Steppe: Turks, Khazars and Quipchaqs. Ashgate. ISBN 0-86078-885-7. Pritsak, Omeljan (1975). "The Pechenegs: A Case of Social and Economic Transformation". Archivum Eurasiae Medii Aevi. The Peter de Ridder Press. 1: 211–235. Pritsak, O. (1976). The Pečenegs: a case of social and economic transformation. Lisse, Netherlands: The Peter de Ridder Press. Taksony was the Grand Prince of the Hungarians after their catastrophic defeat in the 955 Battle of Lechfeld. In his youth he had participated in plundering raids in Western Europe, but during his reign the Hungarians only targeted the Byzantine Empire. The Gesta Hungarorum recounts that significant Muslim and Pecheneg groups settled in Hungary under Taksony. Árpád was the head of the confederation of the Hungarian tribes at the turn of the 9th and 10th centuries. He might have been either the sacred ruler or kende of the Hungarians, or their military leader or gyula, although most details of his life are debated by historians, because different sources contain contradictory information. Despite this, many Hungarians refer to him as the "founder of our country", and Árpád's preeminent role in the Hungarian conquest of the Carpathian Basin has been emphasized by some later chronicles. The dynasty descending from Árpád ruled the Kingdom of Hungary until 1301. Levedi, or Levedias, Lebedias, and Lebedi was the first known voivode of the Hungarians. Levedi's wife was a Khazar princess, and he was close to the Khazar ruling dynasty. He may himself have been part Khazar. According to Constantine VII Porphyrogenitus' De administrando imperio, the Khazars sought to make Levedi the paramount ruler of all the Hungarian tribes, but he refused, possibly because he was childless or because his close ties to the Khazar government were resented by other Magyar leaders. Instead, Levedi proposed Álmos and his son Árpád as leaders of the Magyars. The Magyar settlement between the Volga river and the Urals the mountains were named Lebedia soon to become Levedia after Levedi. Glad was the ruler of Banat at the time of the Hungarian conquest of the Carpathian Basin around 900 AD, according to the Gesta Hungarorum. The Gesta, which was written by an author known in modern scholarship as Anonymus in the second half of the 12th century or in the early 13th century, is the earliest extant Hungarian chronicle. The Gesta did not refer to the enemies of the conquering Hungarians, who had been mentioned in earlier annals and chronicles, but wrote of a dozen persons, including Glad, who are unknown from other primary sources of the Hungarian Conquest. Therefore, modern historians debate whether Glad was an actual enemy of the conquerors or only a "fictitious person" made up by Anonymus. In Romanian historiography, Glad is described as one of the three Romanian dukes who ruled a historical region of present-day Romania in the early 10th century. Blakumen or Blökumenn were a people mentioned in Scandinavian sources dating from the 11th through 13th centuries. The name of their land, Blokumannaland, has also been preserved. Victor Spinei, Florin Curta, Florin Pintescu and other historians identify them as Romanians, while Omeljan Pritsak argues that they were Cumans. Judith Jesch adds the possibility that the terms meant "black men", the meaning of which is unclear. Historians identify Blokumannaland as the lands south of the Lower Danube which were inhabited by Vlachs in the Middle Ages, adding that the term may refer to either Wallachia or Africa in the modern Icelandic language. Álmos, also Almos or Almus, was – according to the uniform account of Hungarian chronicles – the first head of the "loose federation" of the Hungarian tribes from around 850. Whether he was the sacred ruler (kende) of the Hungarians, or their military leader (gyula) is subject to scholarly debate. He apparently accepted the Khazar khagan's suzerainty in the first decade of his reign, but the Hungarians acted independently of the Khazars from around 860. The 14th-century Illuminated Chronicle narrates that he was murdered in Transylvania at the beginning of the Hungarian conquest of the Carpathian Basin around 895. The Battle of Kerlés or Battle of Chiraleș, also known as the Battle of Cserhalom, was an engagement between an army of Pechenegs and Ouzes commanded by Osul and the troops of King Solomon of Hungary and his cousins, Dukes Géza and Ladislaus, in Transylvania in 1068. The Pechenegs had been the dominant power of the westernmost regions of the Eurasian steppes since around 895. However, large Pecheneg groups moved to the Balkan Peninsula at the same time as the westward migration of the Ouzes and Cumans in the 1040s. The first recorded Pecheneg invasion of Transylvania occurred during the reign of Stephen I of Hungary.